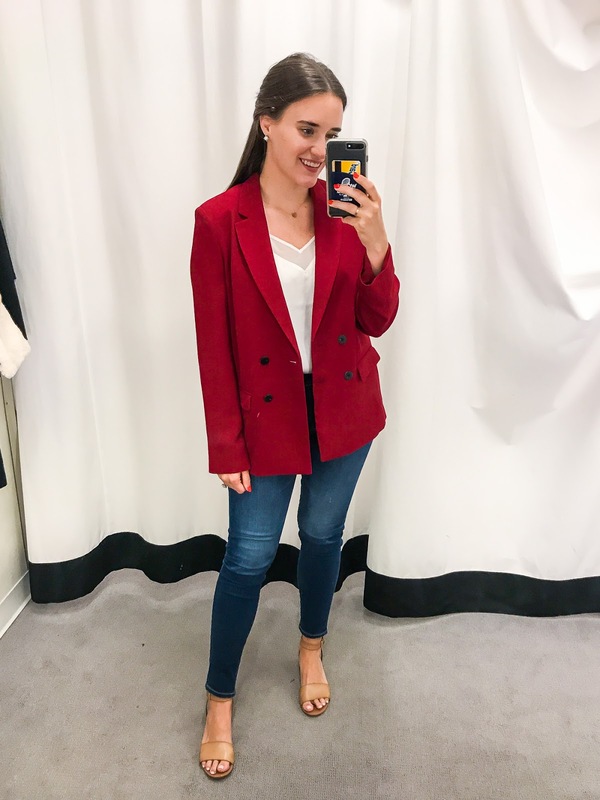 For the Nordstrom Sale I always shop online first and then go into the store a few days later! I do this because things look SO different online than they do in real life I always end up finding some hidden gems in store. 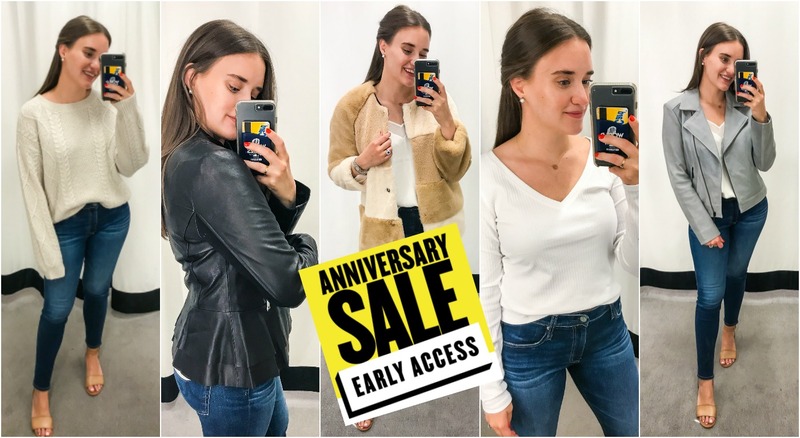 So I took quick snaps of everything I was looking at and gave you a little review of each of them below! Enjoy! 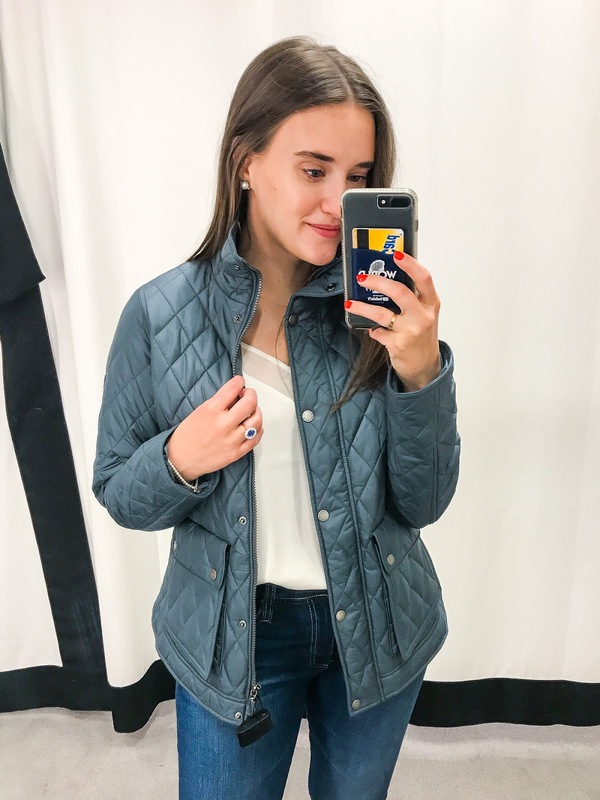 Item: Barbour Fairway Quilted Jacket in "washed charcoal"
Sizing: TTS for Barbour which means to size one size up. I wear a US 8 in all Barbour outside of their waxed jackets that really run TTS. 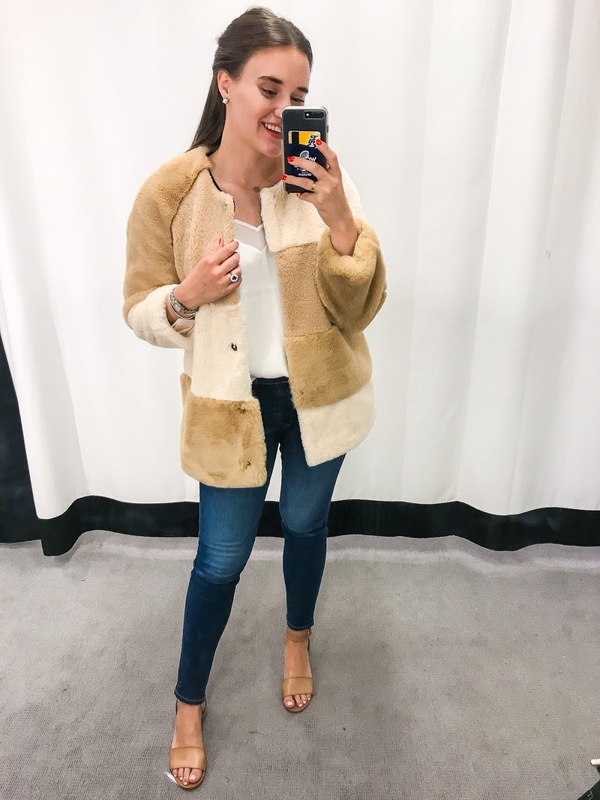 You want a little extra room for layering in the winter too! 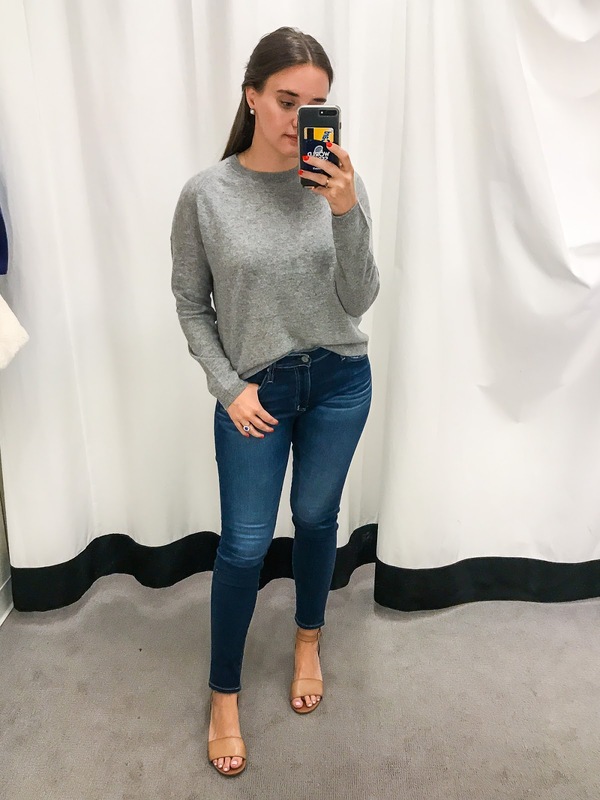 Sizing: TTS -- I'm wearing a M here and it is long which I really like. I'm sure I could go down a size but I like the looser fit of the tank. 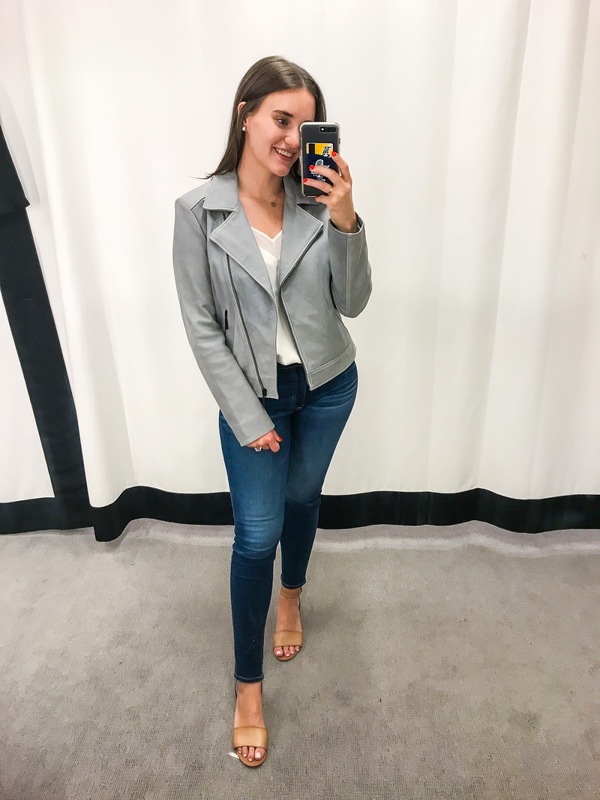 It also comes in black and wine and is perfect for layering! 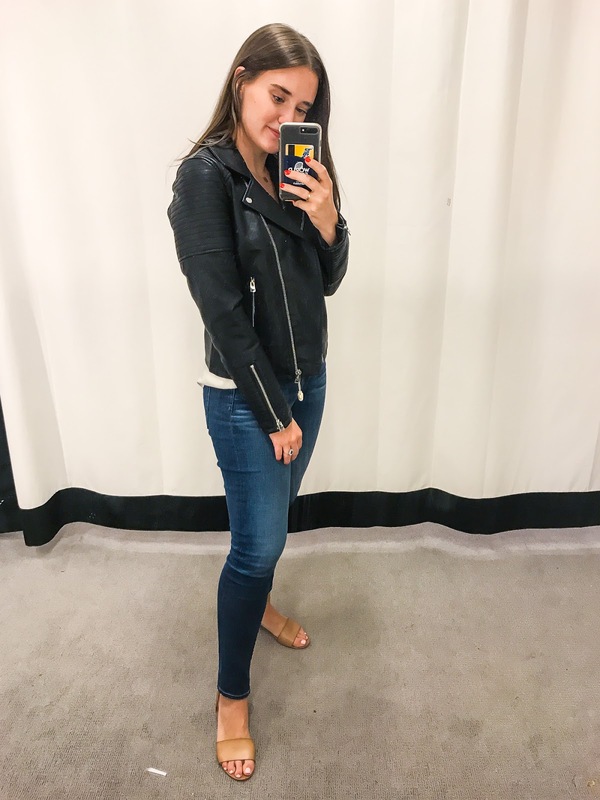 Sizing: TTS for AG jeans -- I wear a consistent 29 in these. They do have some stretch so you can easily fluctuate between sizes but they will never stretch out/be baggy. 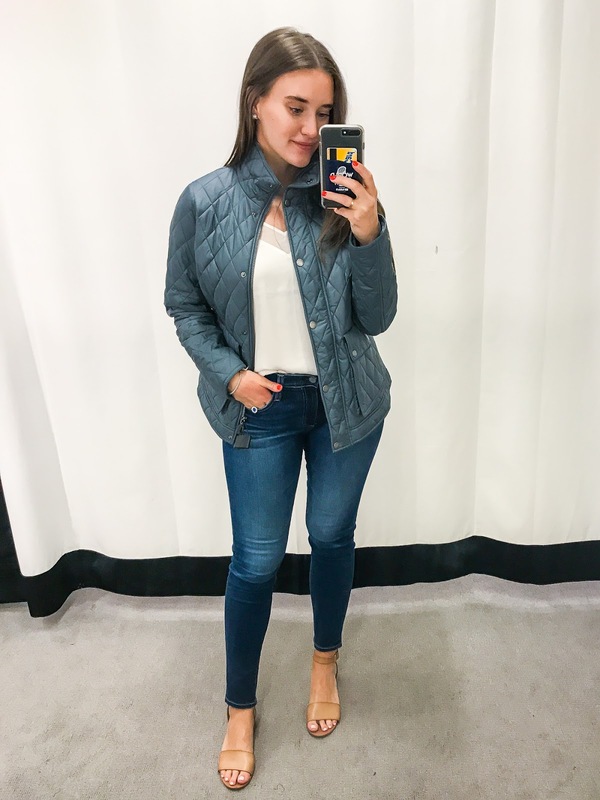 It's one of the things I love most about these jeans! Sizing: Runs one size large. I'm normally a M but I'm wearing the above in a small. 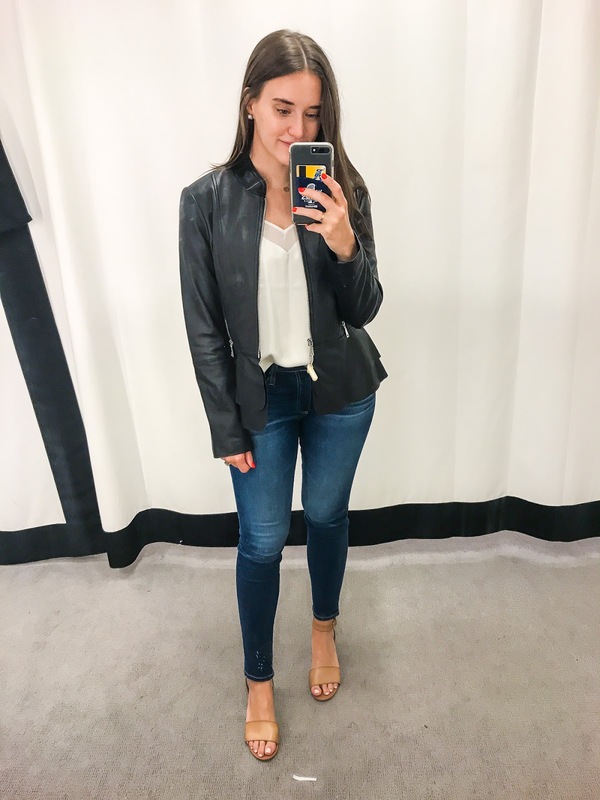 The arms are shorter than regular jackets and have a cropped style to them while the chest/torso area is oversized and baggy. 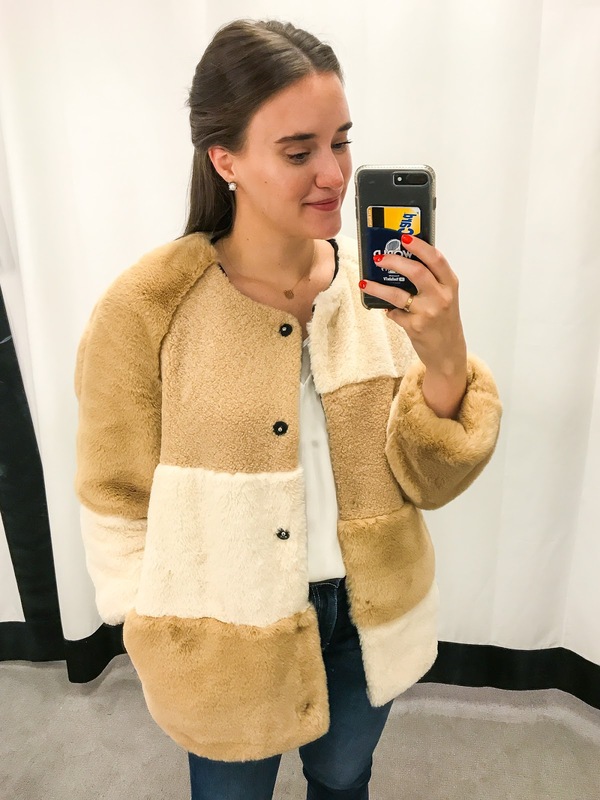 The patchwork style varies from jacket to jacket but this is the SOFTEST thing I tried on! Sizing: TTS for Topshop (which means to size 1 US size up). I'm wearing a 8 US and it fits like a glove. Not great for wearing a ton of layers under it but can fit a long sleeve shirt comfortably. It looks MUCH more expensive than it really is and is now why I have it in both black and grey! 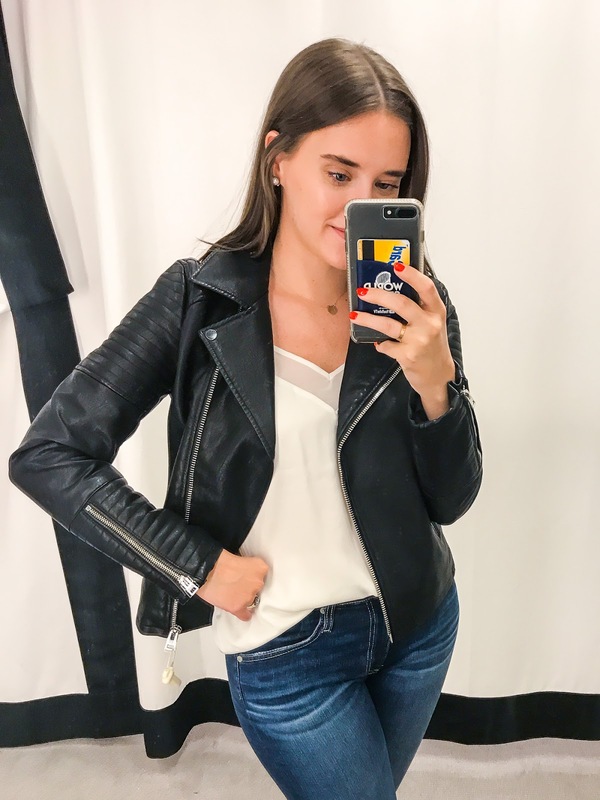 Sizing: TTS for Topshop which means to size one US size up -- so I'm wearing a US 8. 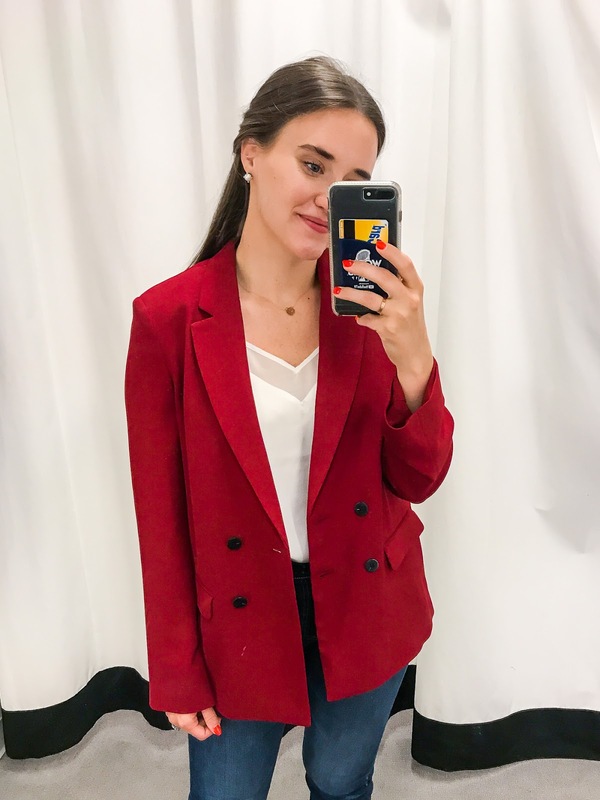 The blazer itself is beautiful and looks very chic but it definitely has an oversized and flowy fit to it. Also, shoulder pads are back!! 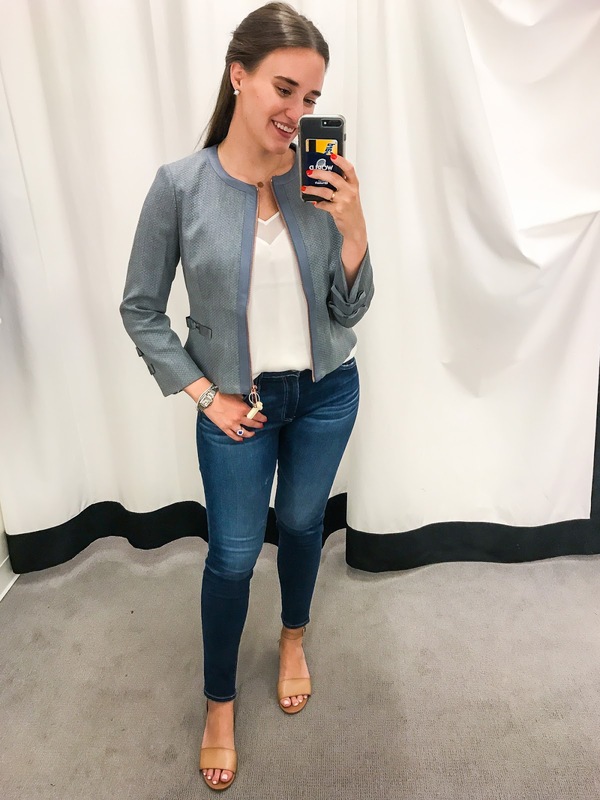 Sizing: Runs one size small -- I am usually a 2 in Ted Baker but this jacket is a 3. I think it's because of the cropped nature of it but really the 3 fit great. 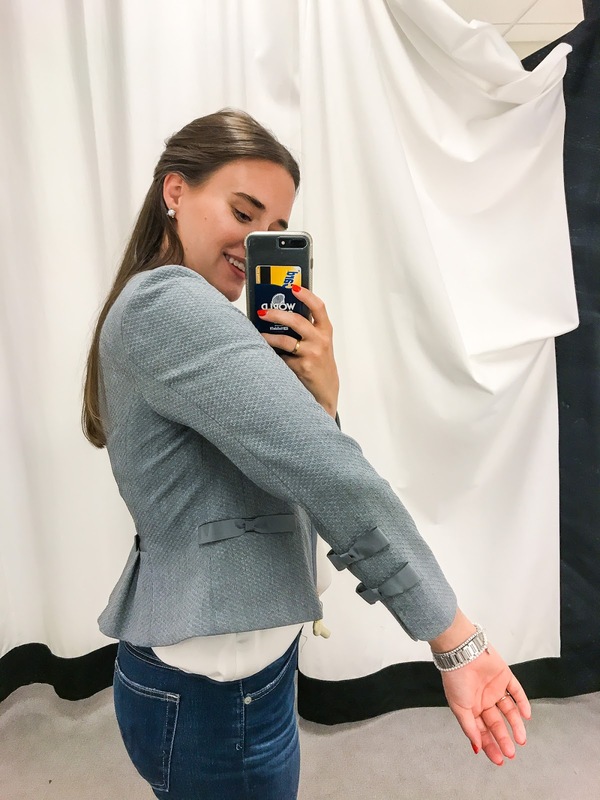 This would be perfect for those who work in a more formal office as you can mix and match this suit jacket with just about everything. I love the little bow detailing too on the pockets and the sleeves! 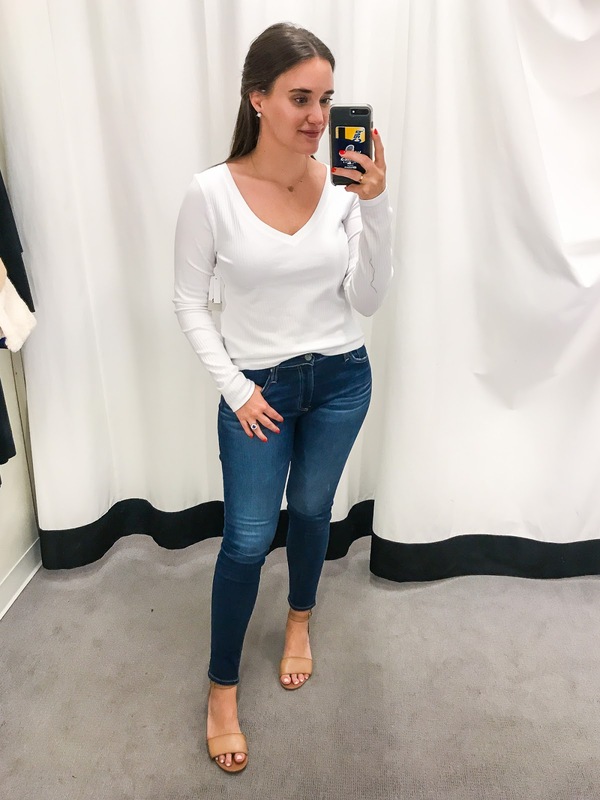 Sizing: TTS -- wearing a M and it fits great! 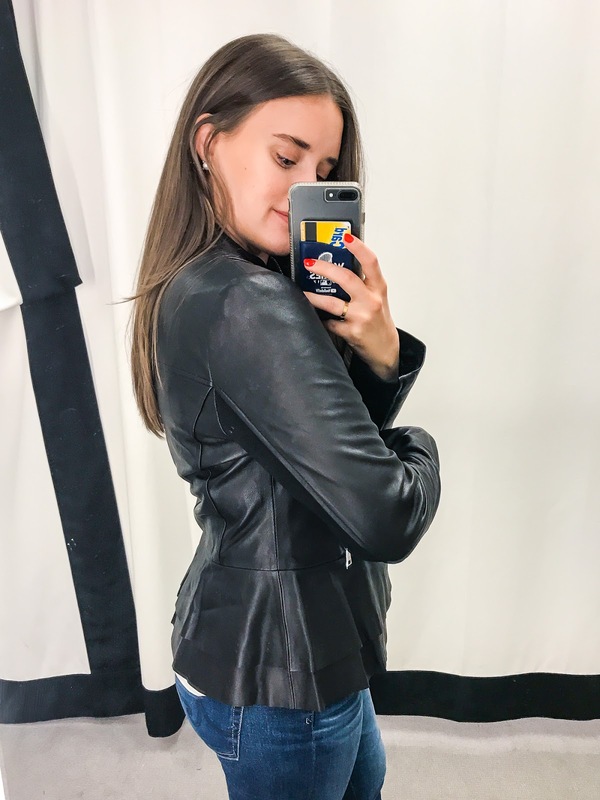 I really really loved this jacket because how often do you see a leather peplum?? 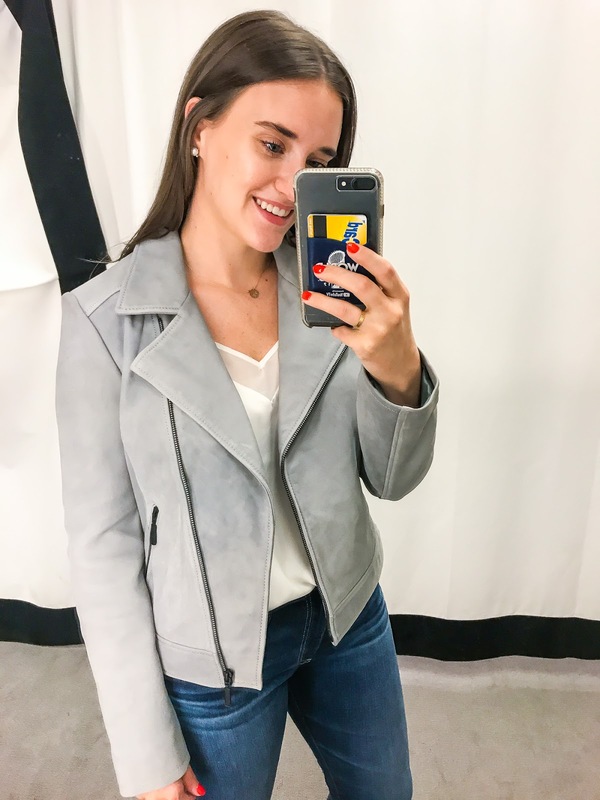 It was so beautifully made and really stunning on but I decided to go with the Topshop one above only because of the price difference! Sizing: TTS and wearing a M here. I liked that it was fitted but not skin tight. I love shirts like this when you don't want to really dress up but you still want to look relatively put together. There is nothing more classic than a nice white t-shirt! 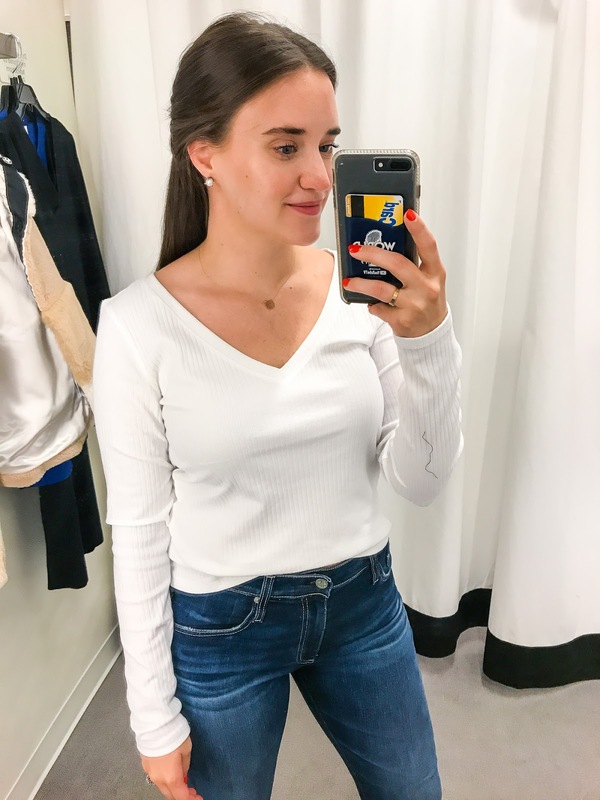 The ribbed detailing in the shirt make it a little more trendy but I really like how it looked and how it flattered my figure! 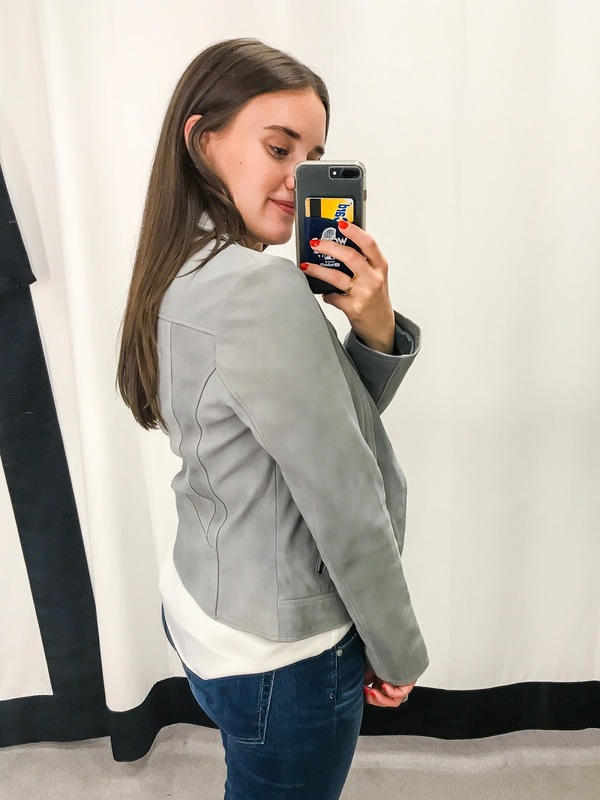 Sizing: Usually Halogen runs a size large for me (meaning I'm normally a small) but in this jacket I'm wearing a M and it fits great. So not totally sure if it runs TTS or not because of how they usually are! But this was hands down my favorite item I tried on in the store. 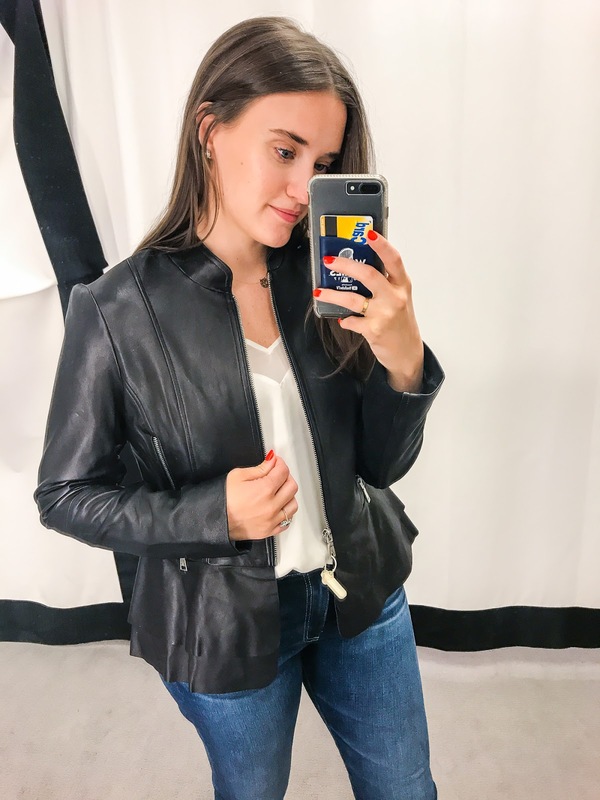 It fit great, it looked SO nice and expensive and it was a really soft leather material. Sizing: Has an oversized fit to it but I'm wearing my normal M above. Online it looks SO boxy but I don't think it's like that in real life at all. 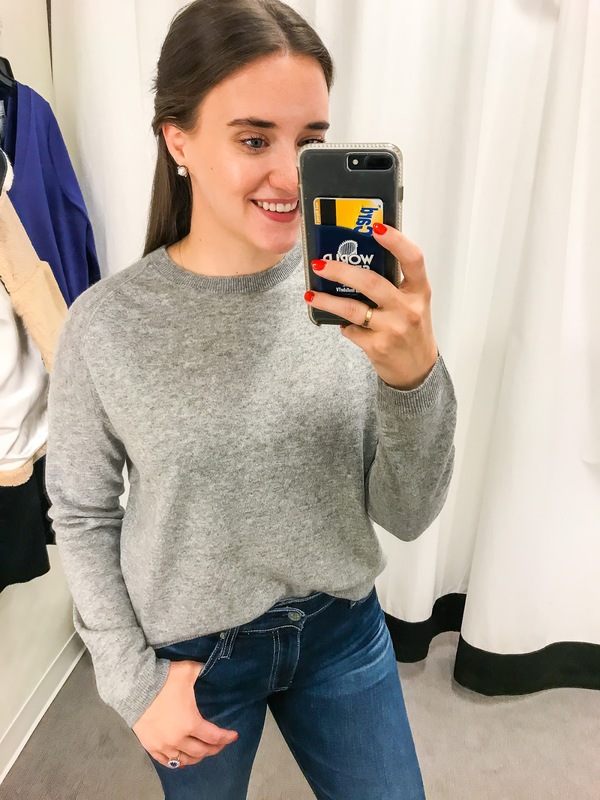 I personally loved this sweater and if I didn't have so many versions of it at home I would take this with me! The cable knitting on the sweater is just to die for. Sizing: TTS -- I am wearing a M above. 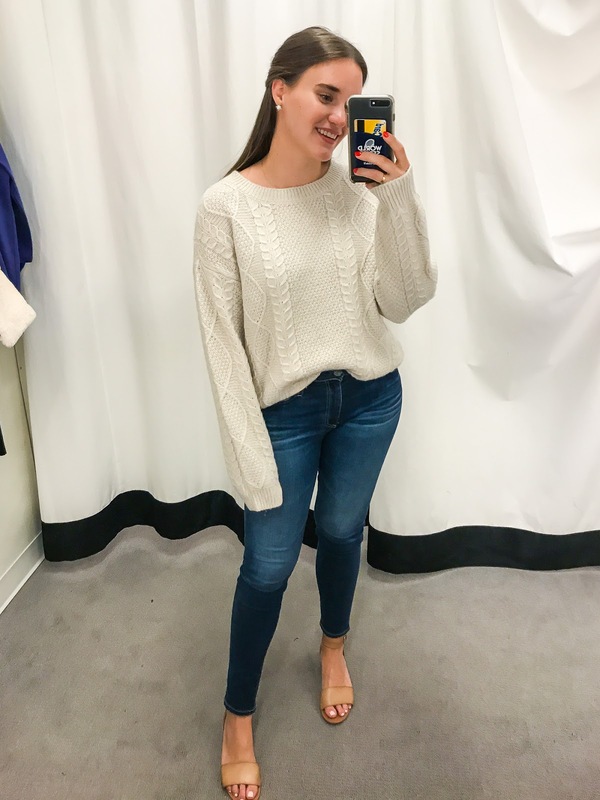 In the description and image online this sweater looks HUGE but that (in my opinion) is not the case at alllll. I mean look at how it wears on me! It's pretty fitted -- so I'm confused. 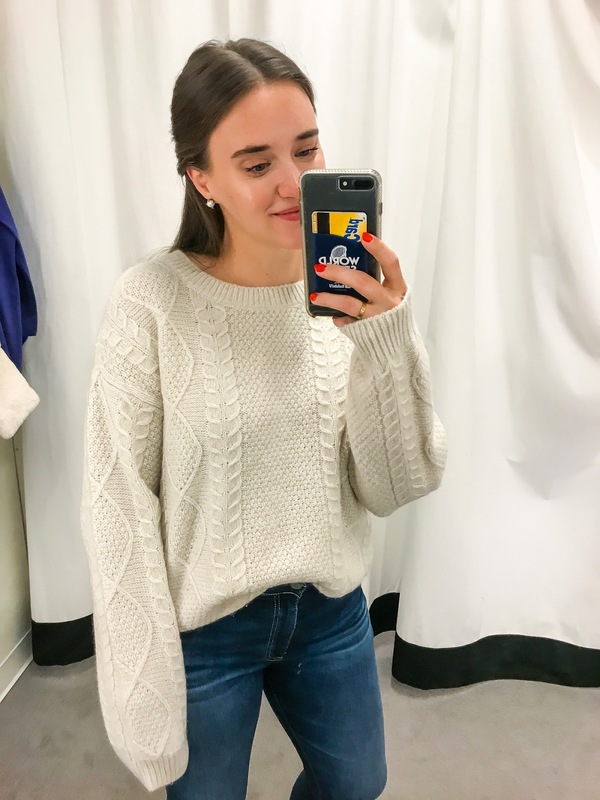 But overall this sweater was SO soft and easy to wear. I really loved the grey color!